In our last post in this series, we studied a completely assembled rifling machine, as used by ancient gunsmiths. Until now, what we were studying were a bunch of descriptions and some hand-drawn pictures (hopefully not too badly drawn :)). It is now time for show and tell. In today's post, we will look at some actual images and movies of people using machines to cut rifling by hand. 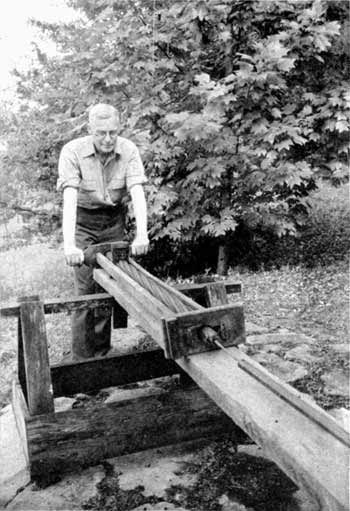 Some of the following images are taken from a book published in 1941, called Rifle Making in the Great Smoky Mountains, authored by Arthur I. Kendall for the US National Park Service. This book is now in the public domain. After the log is shaped into an uniform cylinder, the next step to making an indexing guide is to mark the spirals on the outside of the log surface. Marking the indexing guide. Click on the image to enlarge. Public domain image. In the above image, the woman has wrapped a thin ribbon around the cylinder's outer surface and is marking the edges of the ribbon with a pencil. She will then use a chisel to carve out the wood between the pencil marks. Cutting the indexing guide. Click on the image to enlarge. Public domain image. In the above image, the woman is carving out the indexing guide using a sharp chisel. Typically, the depth of each groove is about 1/2 inch. Notice that she's cutting multiple grooves on this guide. The description we studied earlier only relied on a single groove, but multiple grooves can be used for more accuracy. Part of the rifling machine with indexing head, head piece and tail piece assembled. Click on image to enlarge. Public domain image. The above image shows a partially assembled rifling machine. The indexing head, head piece and tail piece have been assembled and attached, similar to what we had studied earlier here. A complete manual rifling machine. Click on the images to enlarge. Public domain images. In the above two images, we see the rifling machine completely assembled, similar to the one we had studied earlier here. After seeing all the pictures, let us now watch some movies showing this machine in action. In the above movie, the gentleman describes how he made his indexing guide, using a process very similar to what we studied earlier. Also notice that unlike the pictures above, his indexing guide only has one groove on it. The gentleman also goes on to describe the process of cutting the grooves in some detail. In the above movie, we see a gunsmith from the Hensley settlement in Ewing, VA, showing us how his rifling machine works. It is a short movie, but it shows the basics of operation of the machine. Finally, we have another longer movie, where the person shows how he cut rifling using a rifling machine that he made from scratch by himself. While some of tools he used are a little more modern, it is interesting to note that most of the basic principles are unchanged. Interestingly, he marks his indexing guide free hand, instead of using a thread as we studied previously and his indexing head is merely a screw. His design is also a lot more compact and cuts handgun barrels.